Our growing boys need to eat something substantial to keep them full until lunchtime. Fixing one big breakfast for everyone has been easiest up until now. Eating our meal together has been a special time as we begin our days together with yummy food and Bible time. The past few months, however, I’ve been growing a bit burned-out on breakfast prep. Our days are constantly full, our evenings are super busy, and lately when the boys have asked the nightly question, “What’s for breakfast tomorrow?” I’ve had an unseemly urge to grunt loudly and throw a pillow at them. Sweet, huh? Bet you wish I was your mom. Breakfast? I am so over it. Ask me again in a few years when my daily life-with-teenagers schedule demands aren’t so…demanding. Of course, by then there will be fewer people here to feed in the mornings and I’ll not know how to make less than a triple batch of waffles. So basically I’ll be having breakfast issues for the rest of my life. I am giving in to a new way of doing breakfast around here. My morning God time before all the boys get up is so dear to me and basically necessary to my family’s survival – even more than food. This mom needs her quiet chair time in which she spends time seeking Jesus while drinking coffee and soaking in the Word. My sanity depends on it, so I think we can all agree that staying in the chair for as long as possible each morning is much more important than baking muffins. We still need to eat breakfast. We still want to eat this meal as a family. We still want to have our family Bible time together first thing in the mornings. But from now on, the boys will figure out their own breakfasts (except for the rare occasion I find my sanity at an earlier hour and surprise them with French toast). Remember how I told you that teaching your kids to cook when they are young (or old) comes back to bless you one hundred fold when they are older? This is one of those glorious times. My boys are so capable! They can all prepare a simple breakfast for themselves each morning. Then we can all sit down together as normal and instead of starting my day overwhelmed, I’ll sit down with everyone and enjoy our morning devotional. 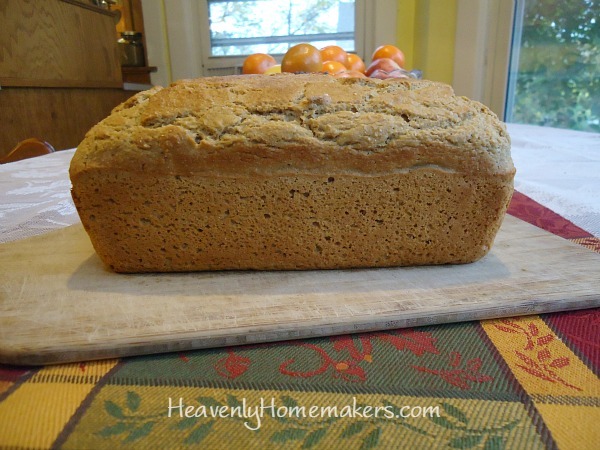 Because this bread is so easy to make, we frequently have some hanging out and ready to eat. It toasts up nicely and makes a tasty part of breakfast. I can easily whip up a batch of this or have one of the boys do it. It keeps for quite a while too, so making huge batches is a good idea – then we have it for breakfast options for a few weeks. 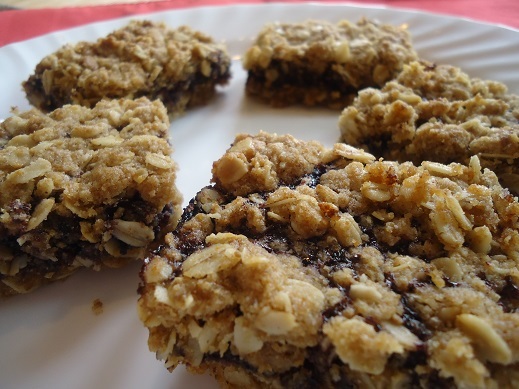 Muffins or Bars (loads of recipes here! )If one of us finds ourselves with time the afternoon or night before, we can prep some baked goods to go with breakfast the next day. It is so helpful to have these on hand IF we can squeeze it in. 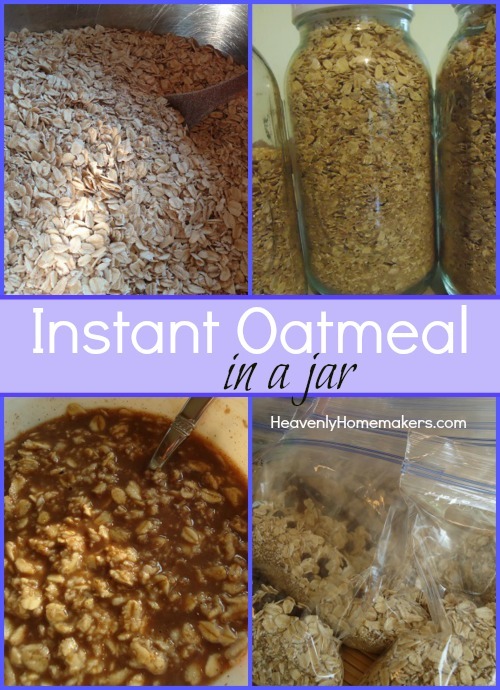 I always have a big jarful of instant oatmeal ready for the boys to make for themselves. It is a life-changing recipe. Make some of this if you haven’t already. 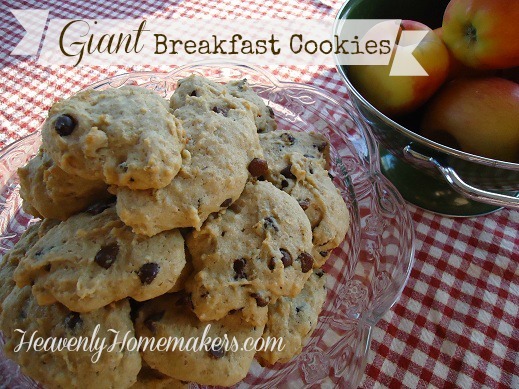 Giant Breakfast CookiesOne of the boys can mix these up and bake them. Then we can keep them in the freezer to pull out as needed. Those basic options, along with eggs and fruit will take care of our breakfasts just fine. When I do have time to make pancakes or waffles, I’ll be sure to make extra for the freezer for additional options. How do you do breakfast at your house? That sounds lovely. But I can’t even imagine the mess mine would leave in their wake (they are younger than yours.) I think I would have better luck assigning someone on different days. We are trying that for some dinners now. I hear you on the burnout. I agree – it’s more important to get everyone out the door with a full belly of healthy food than to eat breakfast as a unit. We’d rather eat dinner together and share how our day went. It helps us grown ups unwind and helps the kids settle down for the evening. And since we have nowhere to rush off to, the dinnertime is much more conducive to praying as a family as well as teaching our toddlers good table manners. This momma loves and craves her quiet time. Only problem is, I don’t like to stop, and can be in my ‘closet’ for 2 hours, so I have to set a timer. I’m trying to figure out how I got everything done — 3 square meals, clean house, finished loads of laundry, homeschool — when my twins were little and needed more of my time, help and energy. Now they are 15 and it seems that most days, I get one meal on the table, the house is always in need of dusting and vacuuming, my husband is always asking if I washed socks and underwear and we don’t always finish all homeschool subjects. What’s up with that?!?! Breakfast is not a meal I put on the table — for about 6 months now, we’ve been drinking protein & greens shakes per doctors orders. It certainly helps us get school started on time!! I don’t know where you are on the “age” spectrum, but I’ve noticed that I just don’t have as much energy as I did several years ago. I’ll turn 50 in a few months and have 16 and 18-year old sons. I have never, ever made breakfast for our family! I have supplies and everyone is on their own. It works! It’s just the two of us, but breakfast is still on your own M-F (and some weekends too). We have a cubbard full of healthy cereal options, yogurt in the fridge, and a bowl of fruit available everyday. When I fix breakfast on the weekends, it’s usually pancakes or corn waffles with the occasional dutch oven potatos. I always enlist my husbands help on weekends. He’s a wonderful kitchen helper. I have been having my boys make breakfast for a couple years. Each of 3 boys has their own “day” – 2 a week, and their day comes with special privileges and responsibilities. So, Son 1 makes breakfast on Mondays and Thursdays, does dishes on Son 2’s days, and clears the table on Son 3’s days. To keep it pretty easy, I let them do eggs or oats. Sometimes they want to cook something more special, but they must give me lots of advanced notice so I can make sure any surprises can fit into our crazy busy schedule. BTW, they are 10, 8, and 5. My children always make their own breakfast even though they are young. Fruit, yogurt, oatmeal – they sleep late so it’s not long till lunch anyway. This mama needs time to straighten her room and throw in some laundry before we start our school day, so it works well for us. You are doing a great thing to let go of something that is stressing you! Weekday breakfasts are usually “help yourself”, with my usually putting out fruit the night before, and often a breakfast “suggestion”, such as bagels or muffins. 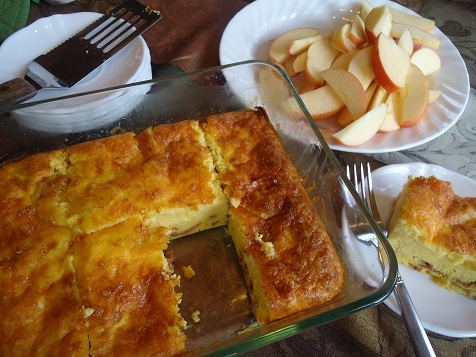 I never made breakfasts for weekday mornings for most of my full-time work years. We used a ton of cereal (as you can well imagine, even though I only have two sons, 16 and 18, and a husband to feed). A little over a year ago, I tried and enjoyed making many of your recipe ideas for awhile. I loved making homemade food, and especially the money it saved (and health benefits), but at the time I was still working full-time, so it kind of burned me out to accomplish it. I’m currently between jobs (part-time for this season of life), but am still finding a balance between the “mostly cereal” days and “everything homemade” days. I think your new ideas are a good place to start. It’s important to recognize the season God has us in and go with it. It’s a constant learning process to understand what our priorities are at the time and how to best care for ourselves and our families. Breakfast for me is homemade yogurt, a small amount of lemon curd, and homemade granola, followed by a hard boiled egg mid-morning. I eat this at least 5 days a week. I only cook a “big” breakfast on the occasional weekend morning. I don’t have the time or energy to cook a large meal every morning before work. Great post! So fun to read. I was wondering what the casserole is in the very first picture next to the apples? I looked through your recipe archives but couldn’t easily figure it out. Is it only featured in one of your ebooks? I also have been doing this. I used to plan breakfasts then greet my kids with a hot meal every morning for many years. My kids are 21,18, and 16. They would wake up at different times ( some not until almost lunch time!) It was making me crazy and I realized they needed more practice in the cooking department too:) I was starting to dread meal planning and I needed to simplify my menu planning to dinner only. This has made such a difference for me. I actually want to cook dinner again and am making more creative meals. This has been a win- win for me. It’s been fun watching them be creative in the kitchen. Lunches now are leftovers or sandwiches. I’m a happy and more relaxed mom now too! 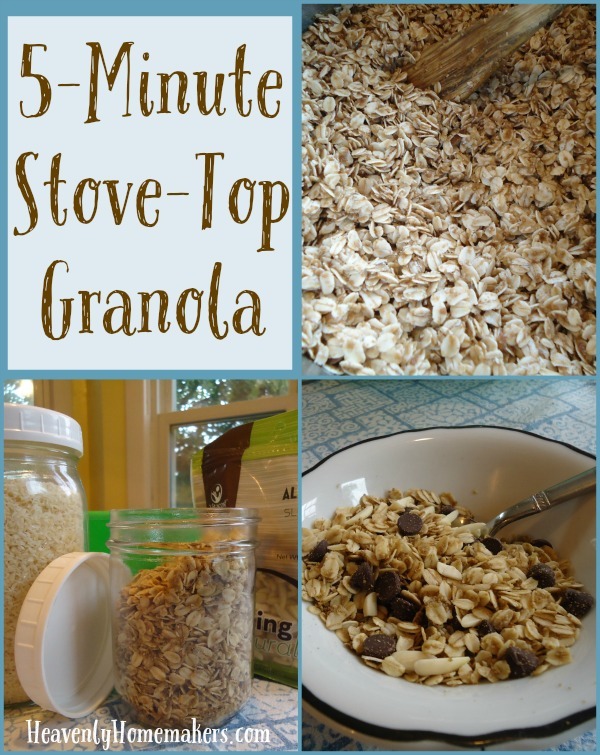 Try this recipe for an easy morning! This makes about 1 cup for each person in our family of 8. Very filling! Mix everything together and store in the refrigerator overnight. Very easy and good! **You can make a lot of different variations. Just combine the oats, milk, yogurt, chia seeds, syrup and vanilla and then add different ingredients. ***I have seen instant coffee, cocoa, flax meal, and protein powder in different recipes as well The internet has lots of ideas! Just google ‘overnight oats’ and you will find them. ? Blessings to you and your family in 2016! !